Pound360 recently stumbled upon a piece at Space.com that reported on an "incredible" development in the solar system last fall. 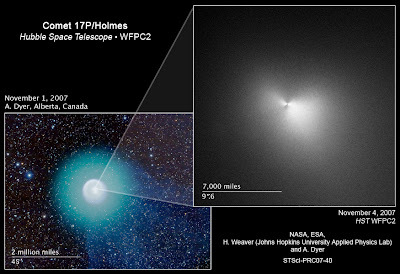 For a brief time, about 24 hours, Comet Holmes had "grown larger than the Sun." For some reason, Holmes "erupted" and its coma (extended atmosphere) of dust and other particles expanded to a diameter greater than that of our Sun's. While the comet's core is a "tiny" 2.2 miles in diameter, its coma reached 870,000 miles after the mystery eruption. Due to the eruption, humble Holmes was suddenly, "one of the brighter objects in the night sky." What may have caused the eruption? Space.com didn't speculate. We at Pound360 wonder if it didn't collide with something (not likely) or if this particular comet is made up of an unusual, unstable mix of materials (you don't hear of Hale-Bop or Halley's comet erupting, do you?). Also, what if a comet were to expand like this while passing close to the Earth? Apparently, this isn't the first time Holmes surprised astronomers. According to Space.com, "it underwent a similar explosive brightening in 1892." A ground-based telescope snapped the image at left. Hubble snagged the one on the right.